Indiana is the latest US state which will not require its schoolchildren to learn joined-up, or cursive, writing. But students will have to learn basic typing skills, which education officials say are more useful in the modern employment world. The move is part of the Common Core State Standards Initiative, which aims to ensure consistency in US education and makes no mention of handwriting. But critics say writing well is a vital skill for life and builds character. 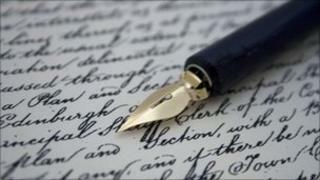 US schoolchildren currently learn to write with joined-up writing from about the age of eight. But under the core standards - which were released in June 2010 and have been adopted by nearly all US states - there is no requirement for them to do so. Children from grade six upwards - about 11 years old - will, however, be expected to "demonstrate sufficient command of keyboarding skills to type a minimum of three pages in a single sitting". Many schools have said there simply is not enough time in the term to teach children both. Dr Scott Hamilton, an Indiana clinical psychologist, said the time children spend labouring over script could be better used. How are they supposed to know how to sign their names? "From an intuitive standpoint, this makes sense, based on the increasingly digital world into which this generation of children is growing up," he said. "I think it's progressive of our state to be ahead on this," she told the Indianapolis Star. Indiana officials have stressed that the standards are not exhaustive and that teachers could continue teaching handwriting if they chose. But some parents, teachers and psychologists have reacted angrily to the move, saying there is more to handwriting than being able to write quickly. "The fluidity of cursive allows for gains in spelling and a better tie to what they are reading and comprehending through stories and through literature," Paul Sullivan, head teacher of a school in California, told CNN. "I think there's a firmer connection of wiring between the brain's processes of learning these skills and the actual practice of writing." Parent Jerry Long told the Indianapolis Star he was worried about what the new system could mean for his sixth grade daughter in the future. "I don't agree with it. How are they supposed to know how to sign their names?"